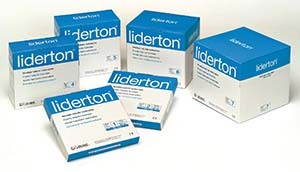 LIDERTON is a tubular bandage, with mild elasticity. Manufactured from the highest quality cotton, Liderton is naturally waterrepellant. It has a variety of applications. Dressing retention, undercast stockinette, and to protect patient’s clothing from ointments and creams. Liderton is woven quality fiber (fine) made with different raw materials: raw natural cotton, bleached cotton, polyester or viscose. Liderton can also be woven in ribbed fabric quality (heavy weave) made with different raw materials: natural raw cotton, bleached cotton or polyester. Contains natural oils which help to make it water-resistant. The bandage holds dressings comfortably and securely in place. Its tubular construction makes it quick and easy to apply, especially when a tubular bandage applicator is used. The range of sizes available allow it to be used to hold dressings in place on any part of the body. Patient comfort and the low price of the bandage make it highly recommendable.